It is cucumber season, so it is time to whip up some super quick refrigerator pickles! 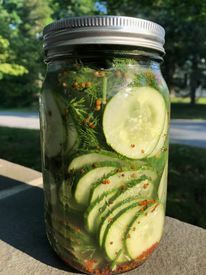 All you need is a clean covered jar, 3 medium unwaxed Kirby Cucumbers, along with the usual ingredients to make a flavorful brine: water, vinegar, sugar, + Kosher salt, plus pickling spices/herbs. This recipe from For A Digestive Peace of Mind uses mustard seeds, coriander seeds, fresh dill and few whole garlic cloves. This mixture provides a nice flavor that doesn’t overpower the cucumber.